“I was one of nine children in a Catholic family where we were not allowed to laugh in the living room,” Judy Tenuta says, explaining how she got into comedy, “we had to wait until Sunday Mass, when the priest asked for money!” She’s been doing comedy for decades, had stand-up specials on HBO, Showtime and Lifetime, and earned two Grammy nominations for her comedy albums. Audiences will recognize her from her appearances on Late Night with David Letterman, Larry King Live, Entertainment Tonight and Comics Unleashed. She’s also an ordained minister of her own signature religion “Judyism”. On Saturday, February 11, 2012, Judy Tenuta will be performing at Jon Lovitz Comedy Club to celebrate pre-Valentine’s Day with her “Put a Ring on It!” show. Showcasing her distinctive quick wit and political savvy, Tenuta entertained a few questions from Working Author. Tenuta has always distinguished herself from other comedians by her outrageous voices, acerbic wit and signature accordion. For shutting down hecklers she even claims to “make the pig come onstage and ride them around until they convert to ‘Judyism’!” Yet there are also universal trials, like incessant travel, that every stand-up comic faces, and Tenuta is no exception. “It’s the travel delays, and waiting on the tarmac while the pilot sobers up that take their toll. But once you hit the stage, an enthusiastic audience makes it all worthwhile.” When it comes to the TSA, however, Tenuta says, “Who doesn’t love a random pat down from a disgruntled security guard on steroids?” It’s hard to tell if she’s joking. With Rosanne Barr throwing her hat into the ring for Presidential candidacy – to which Tenuta asks, “Why not?! She’ll give those stuffy pigs a run for their money!” – there seems to be room for a stand-up comic in the White House. Could President Tenuta be in America’s future? 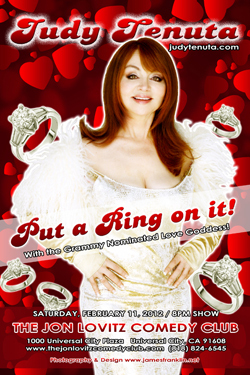 Make sure to catch Judy Tenuta’s “Put a Ring on It!” show at the Jon Lovitz Comedy Club on Saturday, February, 11, 2012. Wow! It’s been ages since I’d thought about Judy Tenuta! Being a very amateur accordion player she intrigued me.